In Nia we use the clock a lot. We don’t actually USE the clock, but we use the idea of a clock face on the ground. When we are moving and dancing we often times refer to the hours on the face of the clock to indicate where to put our feet or move our body. I had mentioned this in my post about Katas. I find that it works well when I am learning the routines. I note the “o’clocks” on my bars. I find it works well when sharing the moves in my Nia classes. And I find that Nia students appreciate having a reference point. It REALLY helps me when there is an actually clock in the room in my line of site. I know that probably sounds silly because the reason we use a clock to assist in the dance is because it is something familiar and constant, but sometimes it just helps to be able to glance up and be able to say, “Step to one o’clock.” I use the clock a lot. Often times our stepping isn’t exactly on an hour. Often times I feel as if it is BETWEEN the hours, say between one and two, but it is still a great reference point. As with many of our moves in Nia it could be that we are stepping on the foot we have placed at a specific hour or it could be that we are pointing or tapping on the hour. Using the hours of the clock as a reference can help prevent confusion when required to state which foot is being used. Since we are moving to music one does not always have time to state, “Cross your left foot to the right diagonal and stop.” And saying, “Left right diagonal” could be confusing, so it is nice to have a set “direction” by using the hours on a clock. So I can say, “Left at 1:00” and that is even more clear than saying either one of the instructions previously stated. It is clear that the left foot is to cross over and land at 1:00. Also it seems to even work better than just saying the directional left and right. If I were to say, “Put your left foot out” I have not actually indicated WHERE to put your left foot, but when I say, “Left to 9:00” it is clear where the left foot should go when it goes “out”. Another example is a bow, it could be executed with the leg directly behind or crossed back so again the clock adds a greater level of instruction. Of course, the participants in a dance exercise class are watching the instructor but giving them verbal instructions allows them to do it in their own body’s way instead of just trying to do it the exact way the teacher’s body is doing it. Some people might have a LARGE clock face on the ground on which they are dancing and other’s might have a smaller one. It all depends on where they leg reaches, but at least they know what direction. In Nia there are even moves that refer to the clock. Within Nia’s 52 moves we have a “slow clock” and a “fast clock“. So as I said we use the clock or at least the idea of a clock a lot in a Nia class. Makes Nia sounds easy, huh? It is. And it is fun. Find a class near you nianow.com or check out my Nia class schedule on my website (www.HelpYouWell.com). This entry was posted on July 24, 2012 at 10:49 pm	and is filed under Nia. Tagged: clock dance, clock face, dance, dance moves, fast clock, katas, looking at the clock, Nia class, Nia Class Schedule, Nia Dance, Nia katas, Nia participants, Nia routines, Nia students, Nia teachers, Nia's 52 Moves, NiaNow.com, slow clock, www.HelpYouWell.com. You can follow any responses to this entry through the RSS 2.0 feed. You can leave a response, or trackback from your own site. Love that! It does make it sound simple. 🙂 I knew exactly what you were talking about. The always amazing Nia. I need to find a class soon! There are a few within 15 miles of your city. I am not sure which would be more convenient, but I bet you could find one. I know it would amaze you further! 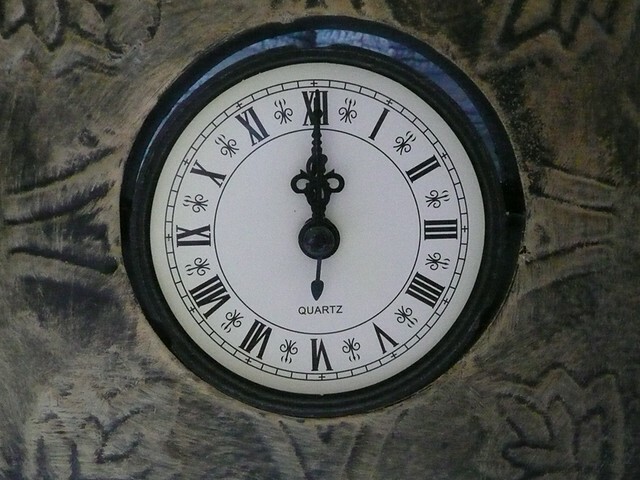 In a digital world, ironically the positions of the face of an old clock will be less understood as time progresses. 😉 Perhaps something more starfleet is in order? “Left foot out on a course of zero nine zero, engage”. This would also appeal to more Trekkies to start Nia. Quite logical when you think about it. You know I was thinking about that, how digital clocks are usually all we have now. I also often think of drawing the clock on the mirror so we have easy and instant reference . . . . ya know for those rooms where there is no clock or it is not in front of us? I DID in fact mention Star Trek today in class so you maybe onto something. I said something about going places where we had not gone before like Star Trek. So I might have some Trekkies in class because a few giggled!